Launched in 1992, Johansen’s Transport is a family owned and operated trucking company that specializes in oversized loads that are otherwise difficult to load and transport. Start a rewarding career with Johansen’s Transport! Just fill out a short online application and we'll get back to you with possible positions. 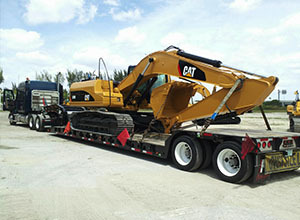 Johansen’s Transport specializes in providing transportation services for heavy equipment. We offer a wide variety of solutions for high priority oversize load and over-dimensional load mobilization. Our team of specialized crew members and equipment allows us to create a custom solution for each client that allows us to excel at mobilizing oversized loads nationwide. We consult with each client and request on an individual basis, working with directly with you and your team to discuss your needs to select the best solution. From over-weight shipments to strategically planning the transport of an over-dimensional load, Johansen’s Transport has become the ultimate construction industry transportation solution, ensuring on-time delivery and quality services for nearly 25 years. To find out more about our services or to submit a request to use our transportation services for heavy equipment for your high priority oversize load, contact Johansen’s Transport by calling our Southeastern Massachusetts office direct or use our online request form to get an estimate. The more information that you are able to provide to us about your over-dimensional load, the more details we will be able to provide you regarding the equipment or construction industry transportation solution available. If you have any questions at all about our services, equipment or our experience in mobilizing heavy cargo, please contact us at 508-678-8850 and speak with one of our knowledgeable customer service agents.